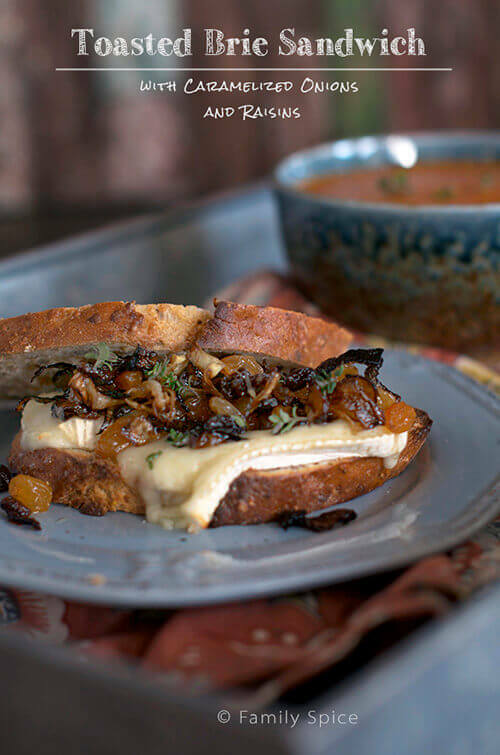 See how the simple grilled cheese sandwich has evolved into this flavor-packed Toasted Brie Sandwich with Caramelized Onions and Raisins. This post is sponsored by Sun-Maid Raisins. As the kids get bigger, their snacks get bigger, too. My kids have evolved from a simple cheese stick or box of raisins to a full blown sandwich or bowl of soup – all as an afternoon snack. Ah, the joys of tweens. And with these growing appetites come an ever evolving repertoire of food likes and dislikes. The once distrusted and disdained mushroom, becomes sought after and requested. Plain noodles is now bathed in pesto sauce. Even plain burgers are now fully loaded. It certainly is keeping this mom on her toes. I’m loving this time of discovery for my kids – especially for their taste buds. The same holds true with the grilled cheese sandwich. Cheddar cheese, which was once the only cheese of choice, is now set aside to try other cheeses of various flavors and textures. This Toasted Brie Sandwich is no different. My eldest has discovered that he loves the caramelized onions and requests it in everything. So why not in this amped up grilled cheese sandwich? 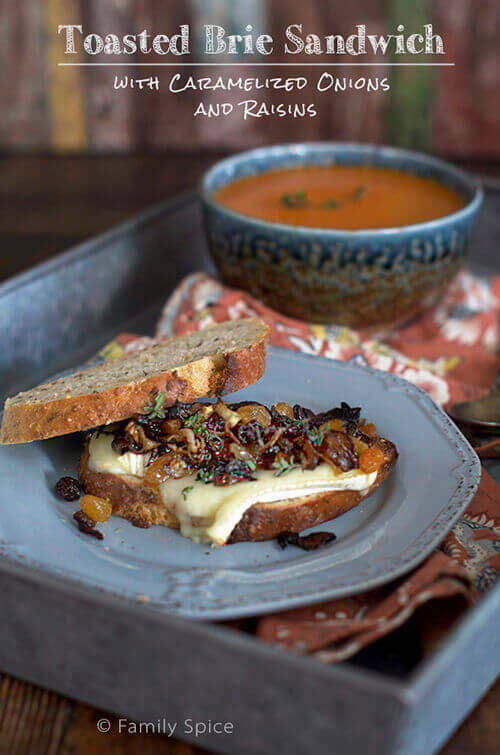 In my last installment creating recipes for Sun-Maid Raisins, I am sharing this Toasted Brie Sandwich with Caramelized Onions and Raisins. 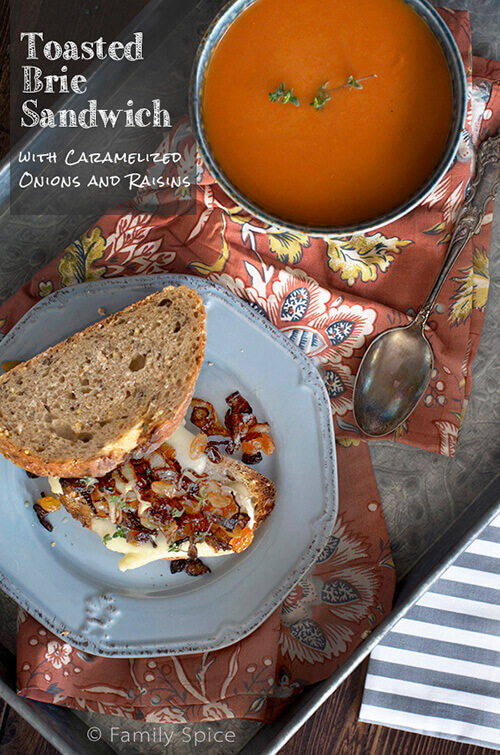 Perfect for this cold weather or paired with a warm bowl of soup. A snack for BIG appetites! Read more about my Toasted Brie Sandwich here. Now THAT is my kinda sandwich! And yes, my teen son can eat an entire dinner when he gets home from school, followed by another dinner at the regular time. Laura what a fantastic sandwich. It’s great that your kids are expanding their culinary tastes. Thank you, Nancy! Yes, it’s been so much fun seeing my kids transform as they get older!